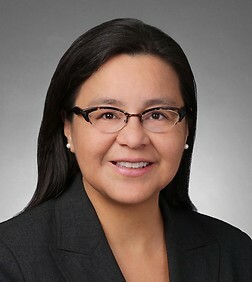 Wilda Wahpepah is a special counsel in the Finance & Bankruptcy Practice Group in the firm's Washington, D.C. office. Ms. Wahpepah represents tribal governments, businesses and entities doing business with tribes across the country. Her areas of emphasis include regulatory counseling and advice related to tribal jurisdiction and governmental matters, gaming, finance and business development, natural resources and environmental law. Ms. Wahpepah represents tribal governments in state, federal, and tribal courts. She is an enrolled member of the Winnebago Tribe of Nebraska. Co-Author, “Piercing the Tribal Corporate Veil,” May 18, 2012, Minnesota CLE Annual Indian Law CLE, Prairie Island, Minn. Co-Author, “Hot Topics in Native American Financing, 2011,” Nov. 3, 2011, Lorman Education Services, Online Webinar. Author, “Internet Gaming,” Oct. 17, 2011, William Mitchell College of Law Second Annual Indian Law CLE, St. Paul, Minn. Co-Author, “Drafting Enforceable Contracts in Indian Country,” May 5, 2011, Minnesota CLE Annual Business Law Institute, Minneapolis, Minn.
Co-Presenter, “Piercing the Tribal Corporate Veil,” May 18, 2012, Minnesota CLE Annual Indian Law CLE, Prairie Island, Minn.
Panelist, “This is My Story,” Nov. 10, 2011, Hamline University Hedgeman Center for Diversity Initiatives, St. Paul, Minn.
Presenter, “Internet Gaming,” Oct. 17, 2011, William Mitchell College of Law Second Annual Indian Law CLE, St. Paul, Minn.
Co-Presenter, “Drafting Enforceable Contracts in Indian Country,” May 5, 2011, Minnesota CLE Annual Business Law Institute, Minneapolis, Minn.
Panelist, “The Practice of Indian Law and the Politics of Identity,” April 4, 2011, William Mitchell College of Law, St. Paul, Minn.
Presenter, “Indian Energy: History, Policy and Moving Forward with Strength”, March 22, 2011, Native American Finance Officers Association conference, Pala, Calif.
Presenter, “Wind Power on Tribal Lands”, October 10, 2010, Midwest Wind Summit, Brookings, S.D. Presenter, “Hot Topics in Indian Law”, April 2, 2009, Federal Bar Association’s 34th Annual Indian Law Conference, Santa Fe, N.M.